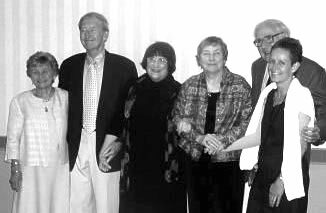 From left to right: Peggy and John Kennell, Phyllis Klaus, Penny Simkin, Marshall Klaus and Annie Kennedy. Drs. Marshall Klaus and John Kennell, Phyllis Klaus C.S.W., M.F.C.C., Penny Simkin, PT, and Annie Kennedy, all renowned experts in childbirth and newborns, founded DONA International in 1992. Their goal was to promote doula care – continuous emotional and physical support for women during labor and early postpartum. Individually and through an extraordinary collaboration over more than 35 years, Drs. John H. Kennell and Marshall H. Klaus have helped us to understand physiologic and behavioral processes of mothers and babies around the time of birth. In turn, they have helped modify obstetric and newborn care to enhance the remarkable inborn capacity of mother and infant to promote their mutual welfare. Dr Klaus, a neonatologist, and Dr. Kennell, a pediatrician, have made major and far-reaching contributions in several areas. They are best known for their research and advocacy relating to bonding and attachment. This work has examined maternal and newborn behaviors at first contact and effects of various maternity policies and practices, including early mother-infant contact and separation. In addition to increasing our understanding of healthy mothers and newborns, Drs. Kennell and Klaus have helped to clarify how we can improve care and outcomes of newborns with health challenges, and how we can help parents cope with tragic losses. This team also conducted the earliest controlled trials examining effects of continuous support from a labor companion, and they continue to evaluate different aspects of this type of care. This body of research has identified a series of notable benefits and no drawbacks. With Phyllis Klaus, Penny Simkin, and Annie Kennedy, Drs. Klaus and Kennell founded Doulas of North America (DONA) to train and certify labor support companions in 1991. Through many presentations and publications, Dr. Kennell and Dr. Klaus have inspired and supported countless caregivers and parents committed to humane care and strong, connected families. Their classic book on bonding has most recently been issued as Bonding: Building the Foundations of Secure Attachment and Independence, with co-author and frequent collaborator Phyllis Klaus. The impact of this work has been and continues to be great. Care in hospitals has been transformed for healthy newborns. Whereas mothers and healthy newborns were often separated for hours or more after birth in the mid-20th century when Drs. Kennell and Klaus began their work, Childbirth Connection's national Listening to Mothers survey found that 40% of babies were primarily in their mother's arms in the first hour after birth last year and a majority were rooming-in for the rest of the hospital stay. These and related practices formed the basis of UNICEF's 1991 Baby-Friendly Hospital Initiative, which is setting the standard and providing support for breastfeeding promotion in many settings throughout the world. Practice in special care units for at-risk newborns has also been improved in important ways. Whereas mother-infant contact was often prohibited until babies reached "term," mothers and other family members are now encouraged to see, hold, touch, and feed premature and challenged newborns. Parents who grieve for the loss of a baby, or for the loss of dreams for a healthy baby, receive more appropriate and helpful support and guidance than in the past. Ten years after the founding of DONA, Childbirth Connection's Listening to Mothers survey found that 5 percent of women in the U.S. were accompanied in labor by doulas, and virtually all women reporting receiving supportive care from one source or another. Services or programs offering continuous support in labor are now available on a smaller scale in many countries throughout the world, including Australia, Bermuda, Brazil, Canada, China, the Czech Republic, Israel, Mexico, South Africa, Tanzania, the United Kingdom, and Zimbabwe. The Congress in Uruguay passed a law decreeing that all women have the right to companionship in labor. Given this trend, we may again come to the point where continuous support is viewed as an essential aspect of care for laboring women rather than an occasional intervention. In developing and applying the scientific evidence for more humane and effective care of mothers, newborns and their families, Marshall Klaus and John Kennell have repeatedly shown vision, compassion, tenacity and courage.